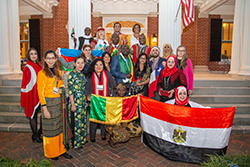 A $201,466 grant through the Fulbright Teaching Excellence and Achievement Program has brought scholars from 20 different countries to UNCW in spring 2019. Amy Garrett Dikkers, an associate professor in WCE’s Department of Educational Leadership and Jennifer Fernandez-Villa, director of international student and scholar services in UNCW’s Office of International Programs, are co-directors on the grant. The Fulbright TEA program enables secondary school teachers from around the world to come to U.S. host universities for six weeks to engage in targeted professional development and growth opportunities. 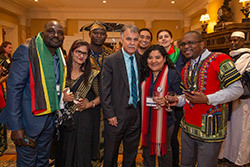 Fulbright TEA is a program sponsored by the U.S. Department of State’s Bureau of Educational and Cultural Affairs (ECA), with funding provided by the U.S. Government and administered by IREX. UNCW is one of 10 universities in the nation to host the cohorts in 2019. While at UNCW, the fellows are participating in faculty-led academic and discipline-specific sessions (secondary school math or English as a Foreign Language), and technology workshops. They are also partnering with New Hanover County Schools teachers through field experiences at local schools. Placements are in Ashley High School, Hoggard High School, New Hanover High School, and Murray Middle School. They will also engage in cultural excursions by attending UNCW’s annual Homecoming celebration and UNCW cultural and sporting events, exploring Wilmington and nearby cities, and visiting local museums. Jeff Ertzberger, Somer Lewis, Allen Lynn, Ginger Rhodes, and colleagues in the Watson College and across campus are partnering with Garrett Dikkers and Fernandez-Villa to provide an enriching experience at UNCW for the participating TEA scholars. UNCW announced the grant award in homepage story on December 10. Read the full story here. View more photos on the Watson College Facebook page.